Methodology & Infrastructure - Building successful marketing on the web requires people who know the tools. Your success in outsourcing development ties to effective project management, technological expertise and service-spirited support. We help you build, test, deploy and host online assets. Agile Practiced - Benefit from the iterative approach and timely processes natural to modern, agile development teams. Performance Focused - Systematically identify problems with paths to resolution for improving functionality, programming and accessibility. Platform Independent - Test and enable positive user experiences — regardless of browser, platform or device. Fully Supported - Enjoy peace of mind with reliable web architecture, hosting and easily accessible technical support. Social Media Applications - Your social media efforts inevitably have technical challenges, from simple instructions to custom development and integrations via geeky acronyms like, “API’s.” We help you through the customization and delivery of Social Engine sites, 3rd-party Facebook applications, social plugins and more. Social Engine Communities - Work with the agency that owns Social Engine, leveraging the most advanced (yet simple) social community platform for white-label (branded) communities to engage niche interests, groups, private communities and more. Dashboard Development - Combine a range of online marketing and social media data into custom reporting dashboards to track big-picture goals as well as daily and campaign-based activity. API Integrations - Increase the value of your web properties by pulling and displaying information and imagery from databases, feeds, widgets, social networks and analytics platforms. Web Development & Integration - Owned web properties are the foundation of your online marketing investment. Our Agile-certified developers help you plan and launch web and mobile experiences to promote your campaigns and brand. Social Engine & WordPress - Work with experts to create, customize, update and optimize branded communities, blogs, websites, landing pages, online press rooms and microsites. Responsive Web Design - Enable your web properties to dynamically adjust and resize for effective viewing across multiple screen resolutions on desktop, tablet and mobile environments. Salesforce Integration - Leverage our developers for marketing automation platform or web application integration with your CRM. Mobile Development - Your mobile audience is growing as the rate of smartphone and tablet adoption increases. 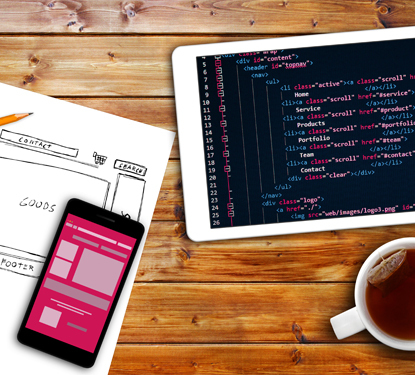 We help you develop web properties, applications and emails that are mobile-friendly. Mobile Websites - Deliver your audience a mobile-compatible experience that is easy to see and navigate on smartphones and tablets. Mobile Community Sites - Let the majority of users accessing your custom community or social website easily engage from their mobile device. Mobile Email Campaigns - Ensure the thirty-five percent of all emails opened on smartphones will meet your campaigns without pinching and zooming.